Bros of the world, your new chariot has arrived. This is Chevrolet’s new RST trim, coming to the 2018 Tahoe and Suburban, and while poseurs might be interested in the chrome-less look, special grille, and brawny 22-inch wheels, enthusiasts should take note of the RST’s impressive performance credentials, but only if you order the optional Performance package. It’s the Performance pack that elevates the RST from a bro-dozer that’s all mouth and no trousers to one that packs some hilarious performance. Gone is the standard 5.3-liter V-8 and its 355 horsepower and 383 pound-feet of torque, and in its place is something Chevrolet dealers and customers have been asking for since these trucks were redesigned for the 2015 model year–a 6.2-liter, 420-hp V-8 engine. Traditionally the engine of choice in the Cadillac Escalade and GMC Yukon Denali, the brawnier engine also packs 460 lb-ft of torque. Working alongside the bigger engine is General Motors’ new 10-speed automatic transmission. Dubbed the 10L80, it’s a close relative of the Camaro ZL1’s Hydra-Matic 10-speed. There’s little reason to suspect it won’t be as impressive in the RST models. Together, the RSTs’ new powertrain returns some impressive preliminary stats. 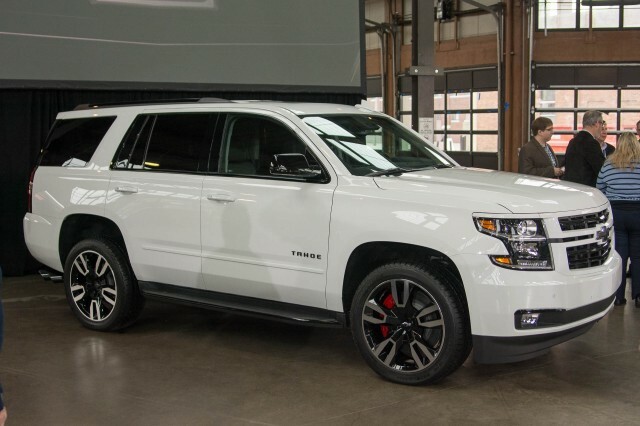 According to Chevy, the Tahoe RST’s 0-60 mph sprint should take just 5.7 seconds which is broadly similar to that of a Volkswagen GTI. And yet, these high-performance SUVs should be able to tow up to 8,400 pounds and have room for up to eight passengers. What they lack in lightness, they make up for in brawn. Perhaps the most absurd–but useful–element of the RST’s Performance package are its brakes. Up front, it includes huge 6-piston Brembo-branded calipers that grab 16.1-inch rotors. These pizza-pan-sized discs increase the rotor area by 42 percent, while the 6-pot stoppers represent an 84-percent bump in brake pad area. Chevrolet hasn’t released pricing for the RST trims quite yet, but we’re expecting that to arrive closer to the trucks’ on-sale date later this year.